There are so many of them, millions and millions, even with the last few years of chronic wasting disease and the dreaded epizootic hemorrhagic disease. They can be found in so many states, and according to the National Shooting Sports Foundation, you can buy tags for them in 45 states. They taste delicious. Talk about organic and healthy food for your freezer. In fact, I call hunting “grocery shopping” in the woods. Even though I hail from a state with whitetails galore, I recently headed to California with a Remington Custom 700 North America in .270, equipped with a Trijicon scope. There I enjoyed a successful blacktail deer hunt. I hate to leave any out. Blacktail deer are small, reclusive deer. Some people poo-poo blacktail meat. Many people prefer the taste of whitetail venison to blacktail. If that is your story, I suggest lots of sausage and jerky made from your deer. The only scent on deer’s antlers occurs during shedding. The area on its head is called the button – where the antlers detach from the deer’s head and regrow every year. Both antlers may not drop at the same time. 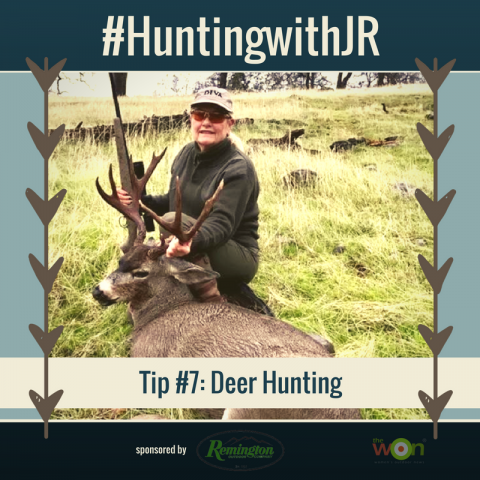 Tip: When glassing deer, notice the size of the antlers. A legal deer (shooter) qualifies when antlers are outside the ears. And in some cases, you must count the points on the antlers, too. Antlers are branched structures made entirely of bone (though they are covered in skin called velvet while growing). Tip: When culling does, make sure to note the shape of a deer’s head. Does are rounded, while button bucks have a side spaces for antlers. Knowing the difference ensures a successful doe cull, or grocery store in the woods success.